Sarah Hall received a BA from Aberystwyth University, Wales, and a MLitt in Creative Writing from St Andrews, Scotland. She is the author of Haweswater, which won the 2003 Commonwealth Writers Prize for Best First Novel, a Society of Authors Betty Trask Award, and a Lakeland Book of the Year prize. Her first collection of short stories, titled The Beautiful Indifference, was published by Faber & Faber in November 2011. The Beautiful Indifference won the Portico Prize for Fiction 2012 and the Edge Hill short story prize, it was also short-listed for the Frank O'Connor Prize. Her second collection, Madame Zero, was published in 2017. The lead story, Mrs Fox, won the BBC National Short Story Award in 2013. 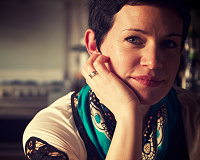 Sarah Hall is an honorary fellow of Aberystwyth University and the University of Cumbria, and a fellow of the Civitella Ranieri Foundation (2007). She is a member of the Royal Society of Literature. She has judged a number of prestigious literary awards and prizes. She is a recipient of the American Academy of Arts and Letters EM Forster Award. She has tutored for the Faber Academy, The Guardian, the Arvon Foundation, and has taught creative writing in a variety of establishments in the UK and abroad. She was born in 1974 and raised in Cumbria and currently lives in Norwich.